NEW YORK (AP) — The “DC” initials that flashed on the Madison Square Garden marquee have a deeper meaning for Daniel Cormier. Cormier draped himself in two title belts, history-making bling that cemented the 39-year-old as one of the greats in the mixed martial arts game. He backed up his boast with authority in New York. Cormier choked out Derrick Lewis in the middle of the second round to retain his heavyweight championship in the main event of UFC 230, becoming the first fighter to defend titles in two weight classes. Cormier, who also holds the light heavyweight crown, made quick work of an overmatched Lewis with a rear naked choke. He celebrated with his family in the cage as Lewis trudged out, still in his trunks unlike the last fight that made him a quick star. Cormier (22-1, 1 no-contest) had a quick takedown in the first and turned in a dominant yet dull effort to easily take the round. He didn’t waste much time in the second and left MSG with a little slice of history. He was still ready to rumble. With trash talk worthy of WrestleMania hype, Cormier called out former UFC heavyweight champion and current WWE star Brock Lesnar for a match in 2019. “Bring that belt with you when you come to my house,” said Cormier, who has vowed to retire at age 40. Cormier won the heavyweight crown when he flattened Stipe Miocic, a bout that ended with theatrics after he called Lesnar into the cage. Lesnar shoved Cormier in the chest while the fighters traded insults to hype a potential future bout. UFC President Dana White has said he wanted a Lesnar-Cormier bout signed for next year, a showcase that would surely be the biggest ever for heavyweights. Lesnar is still with WWE and left the promotion’s controversial Crown Jewel event on Friday in Saudi Arabia as the Universal champion. His status remains as murky as ever — he still has to serve out the remainder of a USADA suspension — and was not spotted at MSG. Cormier beat Anthony Johnson in 2015 to win the light heavyweight title and defended it against the likes of Alexander Gustafsson and Volkan Oezdemir. Cormier has never lost to anyone except Jon Jones, the star-crossed former light heavyweight champion who beat him twice. The second bout last year was changed to a no-contest when Jones failed a doping test that kept him out of the sport for 15 months. Cormier will be stripped of his light heavyweight title and the 205-pound crown will go to the winner of the Jones-Gustafsson bout at UFC 232 on Dec. 29 in Las Vegas. Jones has ruled out a trilogy, and Cormier’s next challenger will surely give him a better fight than Lewis. Lewis (21-6) served 3½ years in prison in his early 20s stemming from a parole violation when he was charged with aggravated assault shortly after high school. Lewis took up mixed martial arts shortly after his release and used his big right hand to ascend to a title shot. He had won nine of his last 10 fights and his self-deprecating humor — including a randy answer as to why he stripped off his shorts inside the cage after his last win — earned him a sponsorship deal with Popeyes Chicken. “Look who just slid into our DMs before the weigh in,” the fried chicken joint tweeted, with a picture of Lewis chomping on a drumstick. Much like attacking a bucket of chicken, Cormier tagged Lewis everywhere: leg, thigh, and then the neck for the decisive blow. The main event had history, if not the thrills of the earlier bouts. Ronaldo “Jacare” Souza connected on a flush right hand to the temple to knock out Chris Weidman in the third round in a battle of two fighters who both badly needed a victory. 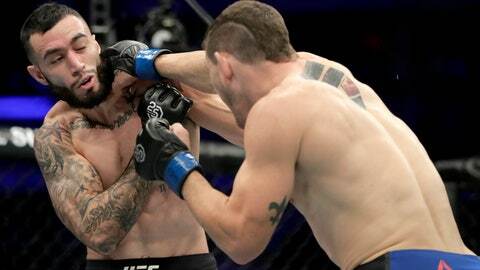 Souza and Weidman were engaged in a brutal slugfest that kept both fighters on their feet for most of the first 2½ rounds. Weidman finally got caught and clung to Souza’s leg as he tried to find his bearings. Souza got a couple of punches in for good measure until referee Dan Miragliotta mercifully stopped the fight. Souza rebounded from a loss to Kelvin Gastelum at UFC 224 and did it with a busted nose. Weidman stunned Souza with a right that smashed the Brazilian’s nose, making it spew blood for the remainder of the first round. Israel Adesanya had a breakout performance with a dominant destruction of veteran Derek Brunson than ran his record to 15-0 and launched him as serious contender in the middleweight division. Adesanya flipped off Brunson early in the first round and finished him not much later for the TKO win. Adesanya landed a knee to the face that stumbled Brunson and finished him off with a left that had the crowd on its feet. Adesanya, who has earned comparisions to a young Anderson Silva, danced in the middle of the octagon on a night where a new star was seemingly born. His bio on his @stylebender Instagram account says he likes to “say the darndest things.” Adesanya had something to witty to say to the MSG crowd. “They say this is a walk in the park? Nah, it’s a walk in the Garden,” Adesanya said.